All Systems Red is the story of a Murderbot who doesn't much get around to murdering, partly because TV is so good and partly because of social anxiety over bonding with humans. Designed to be little more than a gun on legs, rented out to protect survey teams as they explore new planets, Murderbot has hacked its own governor device that ensures complete obedience, but hasn't decided what to do with free will yet. The current mission is to keep a small team of scientists alive on a mostly unsurveyed alien planet, but when something goes wrong at the other survey site on the other side of the world, all of them are thrown into a whole different struggle than they were prepared for. SecUnits—Security Units—are partially biological and partially synthetic, androgynous, very hard to kill, and not meant to have opinions, names or personalities. They're not supposed to act like people at all. The fact that this one does starts the story off on interesting footing from page one. That it likes TV better than reality makes it instantly relatable, despite not being human, and the sarcastic honesty the story is told in makes it fun to read and easy to get involved with. All Systems Red is an introduction to a universe full of corporate entities and colonialism blended with capitalism into something that might turn out to be a fine dystopia, but it also feels like its own story with its own beginning, middle, and end. It's snappy, wry, charmingly awkward, and brings up a lot of details that build a world while mattering specifically to the events at hand—the trick of good worldbuilding. It's the story of a SecUnit struggling with the confines of its reality and the reality of its actual self, all while trying to do the job it doesn't really want to do, but no one else can. At under 200 pages, like all the Tor mini novels, it's a quick read, and there's something of old scifi to the feel of it: robots, alien planets, intrigue, adventures on the edge of known space—all in half of the length of a more recent-style novel. But it's also got the modern feel of a serial TV series like Dark Matter or Killjoys: the antihero against the corporate framework that rules the galaxy but isn't fair. It's just starting to get into what it means to be free, to have free will, and to make choices about life. 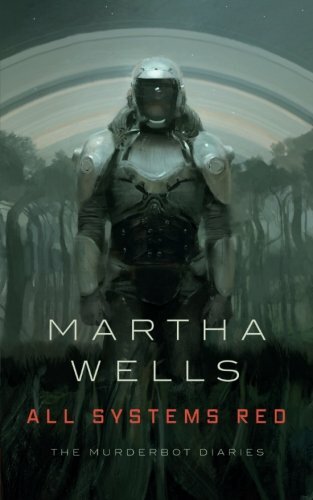 Plus, the comparison of reality with the stories Murderbot watches in its downtime is clever and fun, and keeps the deeper themes from taking over and getting too big for such a short book. And the quirk of behavior that allowed it to want to watch the shows also gave it an edge in beating the bad guys, which is a nice change from all the advice saying we should all watch less TV. All in all, it's fun, and it's very interesting. Can't wait to see what Murderbot does next.